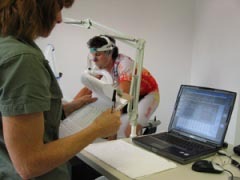 Source Endurance (www.source-e.net) is pleased to announce the availability of world- class sports performance testing at its facility in Austin, TX. The most accurate and highest quality performance testing equipment available world-wide has been acquired to provide clients with a comprehensive foundation of information upon which to base their training. The lab at the Source Endurance headquarters in Austin, TX houses a top of the line ergometer from SRM as well as the most accurate metabolic measurement device available, the TrueOne device from ParvoMedics, and treadmill from Woodway capable of testing sub 4 minute mile pace runners. This equipment is the top tier of performance measurement tools, and provides the underlying performance data from which endurance consulting is delivered to Source Endurance clients. The high level of capabilities at the facility also puts Austin on the map as a member of a very small and exclusive club of geographic locations where an athlete can come to receive this level of sophisticated performance analysis. .
Uli Schoberer, founder and CEO of SRM (www.srm.de) was pleased to see another ergometer deployed in the US, "As one of only five facilities in the US with an ergometer from SRM, the team at Source Endurance has proven that they take very seriously the value of data driven training. We are excited to see this facility open and are looking forward to having more athletes have access to the level of performance measurement quality made possible by our ergometer." Tim Pletcher, founder and CEO of Source Endurance (www.source-e.net), took the opportunity to emphasize his company's commitment to its clients, "Source Endurance was founded on the premise of providing consulting services that are of the highest service quality possible. The investment we have made in the lab, and the acquisition of equipment of the caliber of the SRM, ParvoMedics and Woodway platforms underscores our commitment to providing the finest tools and resources possible for facilitating the success of our clients. There are only a few facilities in the US with the level of sophistication that we have deployed and we know that this level of commitment is required to achieve the results we demand of ourselves in service delivery to our clients."